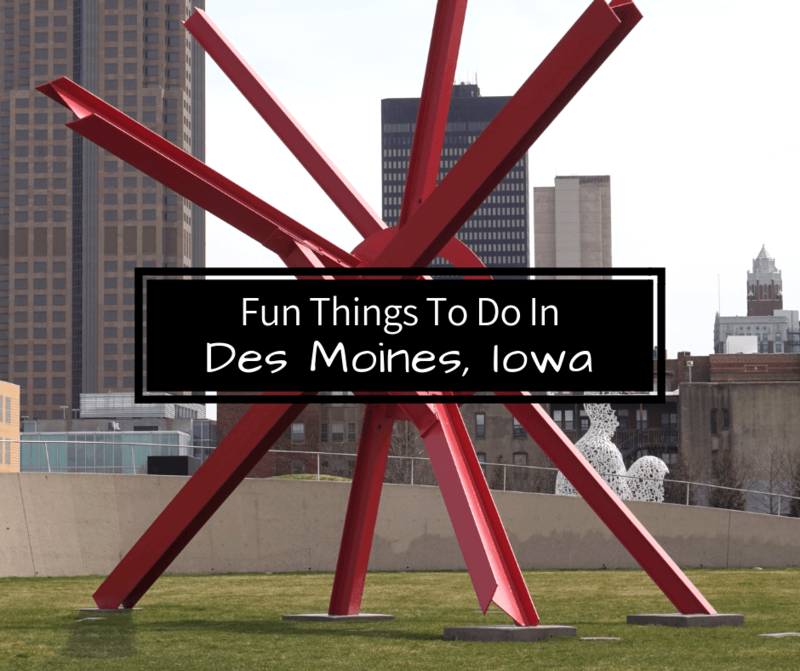 If you’re looking for fun things to do In Des Moines, Iowa we’ve got a great list! Our post also includes suggestions for where to eat in Des Moines and where to stay in Des Moines. One of the top free things to do in Des Moines is to visit the Pappajohn Sculpture Park. This incredible 4.4 acre park in downtown Des Moines has 29 pieces of art and was donated by the Pappajohn’s because they believed that everyone should be able to enjoy art. Speaking of art, make sure to look for murals in downtown Des Moines. We saw a few as we drove around and were pretty happy because we love finding street art in new cities. Some of the pieces we saw reminded us of some of the street art in Miami. We thought these gardens were really nice and designed very well. The geodesic-domed conservatory is a focal point, with a few different gardens inside. There is also an outside garden area that has plants that grow throughout the year and also has many sculptures. One of the must see attractions in Des Moines is the State Capitol building. There are formal tours available, but you can also do a free self-guided tour, which is what we did. Simply pick up an informational pamphlet and you can be on your way, exploring the beautiful building and learning about its history. The art museum is pretty extraordinary because it holds some cool art inside some spectacular architecture, so it’s doubly awesome. We also like the fact that it’s free to enter. Des Moines truly is all about having accessible art for its community. You absolutely have to stop in to RAYGUN when you’re in Des Moines. After all, it is the greatest store in the universe! We wandered all around this store and looked at almost everything they had because it was all so fun or inspirational. Or both! The only downside is limiting how much you let yourself buy. LOL! One of our favorite items! We were only in Des Moines for a day, but the two places we went to came highly recommended by locals. We loved them both so we think you should definitely give them a try. Talk about good coffee and delicious pastries! Our first stop of the day was Scenic Route Bakery and it got us ready for a day of exploration. We had a latte and chocolate chip cookie. Yum! Their sandwiches looked really good too so we’ll have to try one of those next time. OMG. This place changed my life. Normally when it comes to pizza I keep it simple. But we were told we HAD to go to Fong’s and get a Crab Rangoon pizza. We know it sounds weird, but hear us out. It doesn’t have tomato sauce, which we think is what throws everyone off. It has a crab rangoon base, surimi, green onion, asiago and mozzarella, topped with crispy wontons and a sweet chili lattice. It was SO good, we would seriously fly back to Des Moines just for this pizza. We got in to Des Moines the previous night and stayed at the Holiday Inn and Suites West Des Moines Jordan Creek. We liked it because it wasn’t right in the hustle and bust of the city but it was a quick drive to where we wanted to go. Our room was nice and the restaurant had a good menu. We arrived hungry so we appreciated that the restaurant was still open. Ha! I totally made that face when I first read “crab rangoon pizza”! That Raygun store sounds pretty dope too! Most people do lol, but I swear it tastes delicious!! Wow what a cool place Vicky. Funkier than I thought too. for anyone who likes science, or for parents looking for a rainy day activity for kids, the Iowa Science Center is an ideal place to come. It is amazing the stuff you see there. The East Village and the rehabbed buildings that house small, locally owned businesses, the bike and walking trails (hundreds of miles dedicated to such activities). It was hard not to make that face but that’s a heck of a pizza to bite into. It seems like it was easy for you to get around to enjoy all that stuff. It’s been years since I’ve been in Iowa. Is Des Moines a small city or is everything right there in downtown? I would say it’s a medium size city, but a lot of the things to do are around the downtown area. We did have a car though, so it was easy for us to get around. Their street art so amazing! I was very impressed when i saw it during my recent roadtrip here. Oh we know! We can’t wait to go back when we have more time and see more pieces!